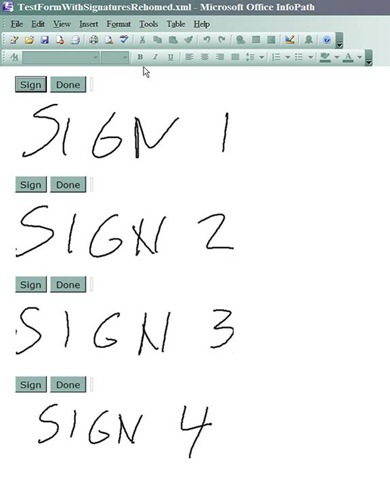 Capturing Multiple Signatures in an InfoPath 2007 Form Using a Topaz Signature Pad | Are you a user? We (Richard Wixom and Russell Wright – RW2) have done some work using a Topaz signature pad to capture an actual image of a signature in an InfoPath 2007 form and store it in the form XML as a base64 encoded image. We blogged about it here. Well, we’ve recently improved upon the process to easily allow multiple signatures to be added to a form template. The new process involves much of the existing code, but encapsulates each signature block as a template part. Adding a template part and tying it to the code is a simple process. In our solution, the template part is added and then the SIGN and DONE buttons are renamed so they reference the same C# code in the form template. So, within a form template, the SIGN and DONE buttons are the same buttons referenced in each of the signature sections. The solution is pretty slick because it looks at the outer XML to find all the controls that are related to the section associated with a signature and doesn’t require the designer of the form to muck with the code. They just add the template part, rename the buttons, and they are on their way. Cool! Chalk up another one for SharePoint Rx. I understand the renaming of the new buttons but how do you get the new instance to set the new signature to a different image file? You don’t say in your explanation.